DIE Martis, 1o Februarii 1736. Epus. Asaphen. Ds. Talbot, Cancellarius. The Lord Chancellor acquainted the House, "That, it not being convenient for His Majesty to be Personally present here this Day, He had been pleased to cause a Commission under the Great Seal to be prepared, in order to the holding this Parliament." Then Five of the Lords Commissioners (in their Robes) being seated on a Form placed between the Throne and the Woolsack; the Lord Chancellor in the Middle; with the Lord President and the Duke of Richmond on his Right Hand; and the Lord Steward and the Duke of Dorset on his Left; commanded the Gentleman Usher of the Black Rod to let the Commons know, "That the Commissioners desire them to come, and hear His Majesty's Commission read." "We are commanded by His Majesty to let you know, that, it not being convenient for Him to be present here this Day in His Royal Person, He hath thought fit, by Letters Patent under the Great Seal, to empower his Royal Highness the Prince of Wales, and several Lords therein named, to do all Things, in His Majesty's Name, which are to be done on His Majesty's Part in this Parliament, as by the Letters Patent will more fully appear." "George the Second, by the Grace of God, of Great Britain, France, and Ireland, King, Defender of the Faith, &c. To all to whom these Presents shall come, Greeting Whereas We have lately, for divers difficult and pressing Affairs, concerning Us, the State and Defence of Our Kingdom of Great Britain and the Church, ordained this Our present Parliament to begin, and to be held at Our City of Westminster, the Thirteenth Day of June, in the Eighth Year of Our Reign; which Our Parliament from thenceforth was prorogued, by Our several Writs, until and to the Fourteenth Day of January, in the Eighth Year aforesaid, and there lately holden; and from thence, by several Adjournments and Prorogations, was adjourned and prorogued to and until Tuesday the First Day of February next, then to be held, and sit at Our City of Westminster aforesaid: And forasmuch as, for certain Causes, We cannot conveniently be present, in Our Royal Person, in Our said Parliament, upon the said First Day of February next: Know ye, that We, trusting in the Discretion, Fidelity, and Care, of Our most Dear and Entirely-beloved Son and most Faithful Counsellor Frederick Prince of Wales; Our Well-beloved and Faithful Counsellor Charles Lord Talbot Our Chancellor of Great Britain; Our most Dear Cousins and Counsellors Spencer Earl of Wilmington President of Our Council, Francis Earl of Godolphin Keeper of Our Privy Seal, William Duke of Devonshire Steward of Our Household, Charles Duke of Graston Chamberlain of Our Household, Charles Duke of Richmond, John Duke of Argyll and Greenwich, Thomas Holles Duke of Newcastle One of Our Principal Secretaries of State, Lionel Duke of Dorset, Henry Earl of Pembroke and Montgomery, Richard Earl of Scarbrough, Archibald Earl of Ilay, Our Well-beloved and Faithful Counsellors William Lord Harrington One of Our Principal Secretaries of State, and Philip Lord Hardwicke Our Chief Justice appointed to hold Pleas before Us; by the Advice of Our said Council, do give and grant, by the Tenor of these Presents, unto the said Prince of Wales, Our Chancellor of Great Britain, President of Our Council, Keeper of Our Privy Seal, Steward of Our Household, Chamberlain of Our Household, Duke of Richmond, Duke of Argyll and Greenwich, Duke of Newcastle, Duke of Dorset, Earl of Pembroke and Montgomery, Earl of Scarbrough, Earl of Ilay, Lord Harrington and Lord Hardwicke, and any Three of them, full Power, in Our Name, to hold Our said Parliament; and to open and declare, and cause to be opened and declared, the Causes of holding the same; and to proceed upon the said Affairs in Our said Parliament, and in all Matters arising therein, and to do every Thing which for Us, and by Us, for the good Government of Our said Kingdom of Great Britain, and of other Our Dominions belonging to Our said Kingdom, shall be therein to be done; and also, if necessary, to continue, adjourn, and prorogue, Our said Parliament; commanding also, by the Tenor of these Presents, with the Consent of Our said Council, as well all and every the Archbishops, Bishops, Earls, Viscounts, Barons, and Knights, as all others whom it concerns to meet in Our said Parliament, that to the same Prince of Wales, Our Chancellor of Great Britain, President of Our Council, Keeper of Our Privy Seal, Steward of Our Household, Chamberlain of Our Household, Duke of Richmond, Duke of Argyll and Greenwich, Duke of Newcastle, Duke of Dorset, Earl of Pembroke and Montgomery, Earl of Scarbrough, Earl of Ilay, Lord Harrington and Lord Hardwicke, and any Three of them, they diligently intend in the Premises, in the Form aforesaid. In Witness whereof, We have caused these Our Letters to be made Patent. "Witness Ourself, at Westminster, the Thirty-first Day of January, in the Tenth Year of Our Reign. "In Pursuance of the Authority given us by His Majesty's Commission under the Great Seal, amongst other Things, to declare the Causes of His holding this Parliament; we are, by His Majesty's Command, in the First Place, to observe to you, that His Majesty acquainted you last Year, that He had, in Conjunction with The States General, given His Approbation of certain Preliminary Articles, concerted and agreed upon between the Emperor and France, for restoring the Peace of Europe; and that a further Convention concerning the Execution of them had been communicated to Him by both those Courts; and that Negotiations were carrying on, by the several Powers engaged in the late War, in order to settle the general Pacification. 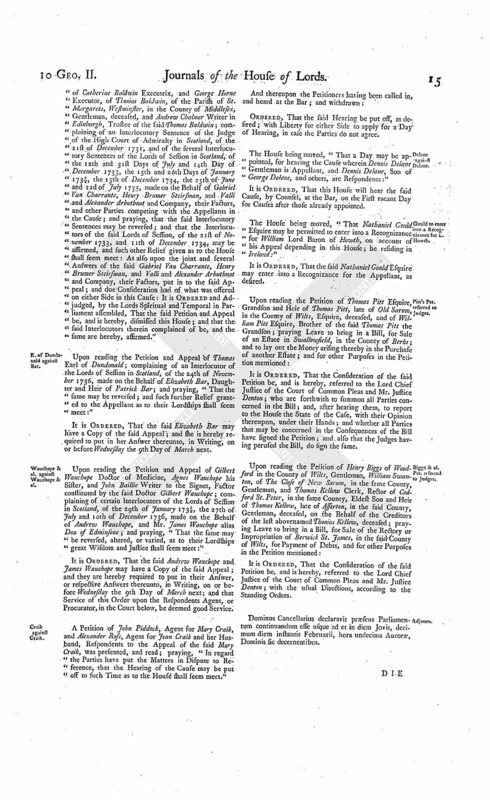 "We are now commanded by His Majesty to inform you, that, the respective Acts of Cession being exchanged, and Orders given for the Evacuation and Possession of the several Countries and Places by the Powers concerned, according to the Allotment and Disposition of the Preliminary Articles, the great Work of re-establishing the general Tranquillity is far advanced: However, it is His Majesty's Opinion, that common Prudence calls upon us to be very attentive to, and observe the final Conclusion of, this new Settlement of such considerable Parts of Europe. It is to be hoped, that a general and lasting Tranquillity will follow this Restitution of Peace; and that the Renewal of Friendship and Alliances, for the Preservation of it among the several Princes and Powers of Europe, will remove all Dangers and Apprehensions of any new Troubles and Disorders: But His Majesty apprehends, that an indolent Security, and too great a Disregard to future Events, may occasion Mischiefs more easy to be prevented than to be remedied; and that it would be very unadviseable to leave ourselves in so defenceless a Condition, as to encourage any Enterprizes which the Enemies to the public Peace may have vainly suggested, and flattered themselves with the Hopes of. "His Majesty has ordered the proper Officers to lay before you the Estimates for the Service of the current Year, as soon as the Circumstances of the Times would permit: His Majesty was pleased to make such a Reduction of some Part of the Public Expences, for the Ease of His People, as was consistent with the Peace and Safety of His Kingdoms, the Security of our Commerce, and the Honour and Interest of the Nation. "His Majesty hath been graciously pleased to direct us to acquaint you, that He hath seen with the greatest Satisfaction the unwearied Application of this Parliament, in framing good Laws, for advancing the Prosperity, and securing the Welfare, of His loving Subjects; and that it hath been One of His Majesty's principal Cares, to enforce them by a due Execution, with the strictest Regard to the Rights and Properties of His People; no Invasion whereof can with any Colour be suggested by the most malicious Enemies of the present Establishment. Whilst this hath been our Condition, His Majesty cannot but observe, that it must be Matter of the utmost Surprize and Concern to every true Lover of his Country, to see the many Contrivances and Attempts carried on, in various Shapes, and in different Parts of the Nation, tumultuously to resist and obstruct the Execution of the Laws, and to violate the Peace of the Kingdom. These Disturbers of the public Repose, conscious that the Interest of His Majesty and His People are the same, and of the good Harmony which happily subsists between Him and His Parliament, have leveled their Sedition against both; and in their late Outrages, have either directly opposed, or at least endeavoured to render ineffectual, some Acts of the whole Legislature. His Majesty, in His great Wisdom, thinks it affords a melancholy Prospect, to consider to what Height these audacious Practices may rise, if not timely suppressed; and that it deserves no small Attention, that they may go on to affect private Persons in the quiet Enjoyment of their Property, as well as the general Peace and good Order of the Whole. His Majesty apprehends it to be unnecessary to enlarge upon a Subject of this Nature; and therefore hath commanded us barely to mention it to you, who, by the constant Tenor of your Conduct, have shewn that you consider the Support of His Authority, and the Security of His Government, as inseparable from the Preservation of the public Tranquillity, and your own Safety." And the House was adjourned during Pleasure, to unrobe. Certificate of the Election of E. of Bredalbane. 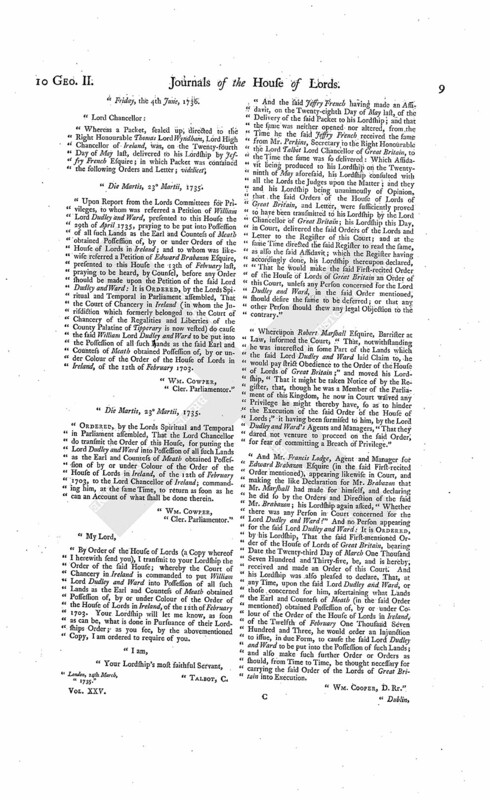 "We do hereby certify, that, by virtue of Her Majesty's Proclamation of the Second of September, One Thousand Seven Hundred and Thirty-six, a Certificate, under the Hands and Seals of Mr. John Murray and Mr. Thomas Gibson, Clerks of Session attending the Election aftermentioned, in virtue of the Lord Register's Commission to them granted, has been delivered into the Crown-office in Chancery; whereby it appears, that John Earl of Breadalbane was unanimously elected and chosen to sit and vote in the House of Peers, in this present Parliament, in the room of Alexander Earl of Balcarras, deceased. "Given under our Hands, this Fourth Day of November, 1736. John Earl of Westmorland sat first in Parliament, after the Death of his Brother Thomas Earl of Westmorland. Also, Edward Lord Clifton of Laighton Brumswold, after the Death of his Uncle Edward Lord Clifton. Hodie 1a vice lecta est Billa, intituled, "An Act to prevent the Poor's being defrauded." The Lord Chancellor reported the Speech of the Lords Commissioners for holding the Parliament. Ordered, by the Lords Spiritual and Temporal in Parliament assembled, That an humble Address be presented to His Majesty, "To express our unalterable Duty and Affection to His Person and Government: To declare, that our real Regard for the common Interests of Europe, in which it is impossible for this Nation to be unconcerned, makes us take great Satisfaction in being acquainted that the Re-establish ment of the general Tranquillity is far advanced; and in the pleasing Hopes that all Dangers and Apprehensions of new Troubles may be happily removed: To express our just Sense of the fresh Instances His Majesty has given of His Royal Concern for our Welfare, by putting us in Mind to be attentive to the Conclusion of this great Work; and to assure Him, that we cannot make so unbecoming a Return for His Goodness in avoiding to involve this Nation in a War, as to shew any Signs of an indolent Security, or to leave ourselves in a defenceless Condition: To give His Majesty the strongest Assurances, that we will chearfully concur in all such Measures as shall be necessary, to maintain the Honour and Safety of His Majesty and His Government, and the true Interest of His Kingdoms: To testify our Gratitude for His Majesty's gracious Approbation of the Conduct of this Parliament; for His vigilant Care duly to execute the Laws, and protect the Rights and Properties of His Subjects: To declare our Detestation of the late insolent Riots and Tumults, carried on in Defiance of the Law, and in Opposition to the Authority of His Majesty and His Parliament, so happily united in their Views and Interests: To express our humble Opinion, that such audacious Practices ought to be timely suppressed; and to assure His Majesty, that our Endeavours and Assistance shall never be wanting, to support His Authority, and to preserve the Quiet and Security of the Nation." Their Lordships, or any Five of them; to meet immediately, in the Prince's Lodgings. "We, Your Majesty's most dutiful and loyal Subjects, the Lords Spiritual and Temporal in Parliament assembled, beg Leave to approach Your Throne, with Hearts full of that Zeal and Affection for Your Person and Government, which become the most faithful Subjects to the Best of Kings. "Our Duty and Gratitude to Your Majesty have, on many Occasions of this Nature, called upon us to lay at Your Royal Feet our thankful Acknowledgements, for preserving to Your own Subjects the Blessings of Peace: And the additional Motive of our unfeigned Regard to the common Interests of Europe, in which it is impossible for this Nation to be unconcerned, makes us now receive with great Satisfaction Your gracious Communication, that the Re-establishment of the general Tranquillity is far advanced. "How happy and secure soever Your Majesty's Wisdom, under the Protection of the Divine Providence, may render these Kingdoms; it was impossible for us to remain wholly unaffected with the Miseries of War suffered by other Parts of Christendom; and we cannot but rejoice in the pleasing Hopes that all Dangers and Apprehensions of new Troubles may be happily removed. "At the same Time, we esteem it a fresh Instance of Your Majesty's never-failing Care of the public Welfare, that You put us in Mind to be attentive to the final Conclusion of this great Work. As Your Majesty hath on Your Part distinguished Your Paternal Tenderness for Your People, in not permitting them to be hastily involved in the Calamities of War; it would be the most unbecoming Return for so great a Benefit, to shew any Signs of an indolent Security. And we beseech Your Majesty, to accept the strongest and most affectionate Assurances, that we can never entertain the least Thought of leaving ourselves in a defenceless Condition: But that we will always chearfully concur in all such Measures as shall be necessary, to maintain the Honour and Safety of Your Majesty and Your Government, and the true Interest of Your Kingdoms. 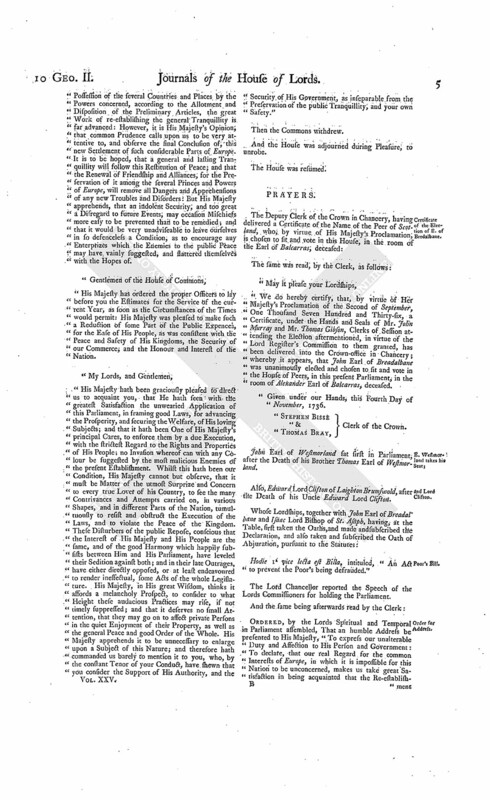 "The gracious Approbation which Your Majesty is pleased to give of the Conduct of this Parliament affords us great Comfort and Encouragement; and Your vigilant Care to execute the Laws with Justice and Impartiality, and to protect the Rights and Properties of all Your Subjects, sills our Minds with the most lasting Impressions of Thankfulness: Under this deep Sense of our Obligations to Your Majesty, we cannot sufficiently express our Detestation of those insolent Riots and Tumults which have of late appeared in different Parts of the Kingdom, in Defiance of the Law, and Violation of the Public Peace. Every Part of the Behaviour of these daring Offenders appears to us as weak and unreasonable as it is wicked; except that they have considered the Interests and Views of Your Majesty and Your Parliament as being so closely united, that it was impossible to traduce or oppose the one without including the other. Our Duty, as well as our Safety, makes it incumbent upon us to give another Mark of this happy Union, by testifying our humble Concurrence in Your Majesty's just Opinion, that such audacious Practices ought to be timely suppressed: And as we do, with the firmest Confidence, rely on Your Majesty's Authority being prudently and vigorously exerted for this necessary End; so we assure Your Majesty, with the greatest Sincerity, that our Endeavours and Assistance shall never be wanting, to support that Authority, and to preserve the Quiet and Security of the Nation." Ordered, That the same be presented to His Majesty by the Lords with White Staves. V. Torrington. L. Bp. Oxon. The House taking Notice, "That there is such an Interruption, by Hackney Coaches, Carts, and Drays, in the Streets, and the Passages between Charing Cross and The Old Palace Yard in Westminster, that the Lords and others are frequently hindered from coming to this House, to the great Inconveniency of the Members of both Houses:"
It is thereupon Ordered, by the Lords Spiritual and Temporal in Parliament assembled, That the High Steward of the City of Westminster, or his Deputy, together with the Justices of the Peace for the said City, shall, by their Care and Directions to the Constables and other Officers within the said Limits, take special Order, that no empty Hackney Coaches be suffered to make any Stay, between Whitehall and The Old Palace Yard in Westminster, from Eleven of the Clock in the Forenoon until Five of the Clock in the Afternoon of the same Day, during the Sitting of this Parliament; and that no Carriages, Drays, or Carts, be permitted to pass through the said Streets and Passages, between Charing Cross and The Old Palace Yard, between the Hours aforesaid, during the Sitting of this Parliament; and herein special Care is to be taken, by the said Deputy Steward, Justices of the Peace, Constables, and all other Officers herein concerned, as the contrary will be answered to this House: And it is further Ordered, That the High Bailiff of the City of Westminster, and the Justices of the Peace for the City and Liberty thereof, or some of them, residing in Westminster, be served with the Order of this House made this Day, for the Purposes aforesaid. Ordered, That the Cause wherein Catherine Baldwin Executrix, and George Horner Executor, of Thomas Baldwin deceased, are Appellants, and Gabriel Van Gharrante and others are Respondents, which was the First Cause upon the Paper lest unheard at the Close of the last Session of Parliament, be heard, by Counsel on both Sides, at the Bar, on Monday next; and that the other Causes formerly appointed, and remaining unheard, be proceeded in on the Wednesdays, Fridays, and Mondays following. Dominus Cancellarius declaravit præsens Parliamentum continuandum esse usque ad & in diem Jovis, tertium diem instantis Februarii, hora undecima Auroræ, Dominis sic decernentibus. Viscount Lymington. Ds. Harrington, Unus Primariorum Secretariorum. Dutchess of Bucks against Sheffieild & al. "I thank you for this dutiful and loyal Address. The Affection you shew to My Person and Government gives Me the greatest Satisfaction. "My principal Care is, to secure to My People the Blessings of Peace, and the full and undisturbed Enjoyment of all their Civil and Religious Rights, and to preserve the Tranquillity and good Order of the Kingdom. "The Continuance of the good Harmony between Me and My Parliament will enable Me to pursue with Effect those great and desireable Ends." Ld. Dudley & Ward against Brabazon: Account of Proceedings in Ireland transmitted. The Lord Chancellor acquainted the House, "That, he having wrote to the Lord Chancellor of Ireland, pursuant to their Lordships Directions the last Session of Parliament, touching the Matter of the Possession of certain Lands in that Kingdom claimed by the Lord Dudley and Ward, he had received Two Letters from the said Lord Chancellor, and Two Orders of the Court of Chancery in Ireland, in relation to that Matter." "Enclosed I return to your Lordship an Account of what has been done in the Court of Chancery of Ireland, in Pursuance of the Orders of the House of Lords of Great Britain, made the 23d Day of March last, and transmitted with your Lordship's Letter dated the 24th Day of the same Month, but not delivered to me till the 25th Day of May. I had made this Return immediately after the herewith enclosed Order was pronounced, but that I thought it more proper to defer it till after the last Seal, that, if any Application had been made in Behalf of the Lord Dudley and Ward, I might have informed your Lordship of what had been done upon it. As no one has appeared on his Lordship's Behalf, I think it my Duty to make this Return of what has been hitherto done, in Obedience to the Order of the House of Lords. "I send this by the Post, as the most expeditious Method of conveying it; but, if your Lordship should chuse to have it sent by a Messenger, I will transmit another Office-copy of the Order, in that or any other Manner which I shall know to be most agreeable to your Lordship. "To the Right Honourable the Lord Talbot, Lord High Chancellor of Great Britain." "Friday, the 4th June, 1736. "Die Martis, 23o Martii, 1735. 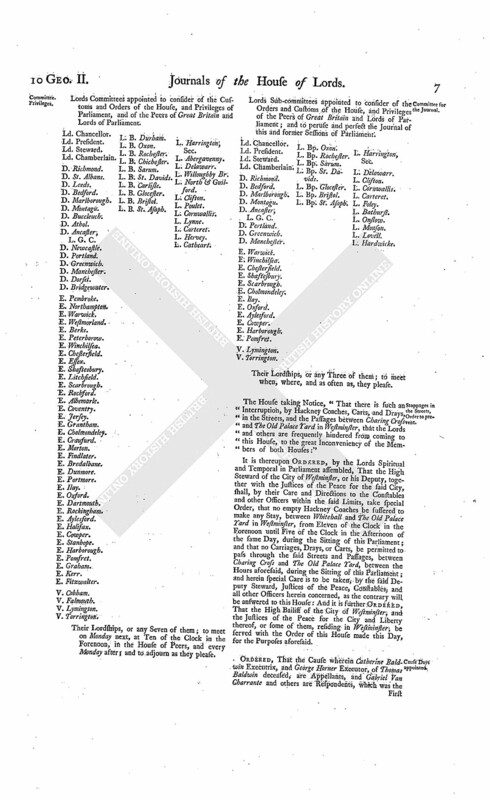 "Upon Report from the Lords Committees for Privileges, to whom was referred a Petition of William Lord Dudley and Ward, presented to this House the 29th of April 1735, praying to be put into Possession of all such Lands as the Earl and Countess of Meath obtained Possession of, by or under Orders of the House of Lords in Ireland; and to whom was likewise referred a Petition of Edward Brabazon Esquire, presented to this House the 13th of February last, praying to be heard, by Counsel, before any Order should be made upon the Petition of the said Lord Dudley and Ward: It is Ordered, by the Lords Spiritual and Temporal in Parliament assembled, That the Court of Chancery in Ireland (in whom the Jurisdiction which formerly belonged to the Court of Chancery of the Regalities and Liberties of the County Palatine of Tipperary is now vested) do cause the said William Lord Dudley and Ward to be put into the Possession of all such lands as the said Earl and Countess of Meath obtained Possession of, by or under Colour of the Order of the House of Lords in Ireland, of the 12th of February 1703. 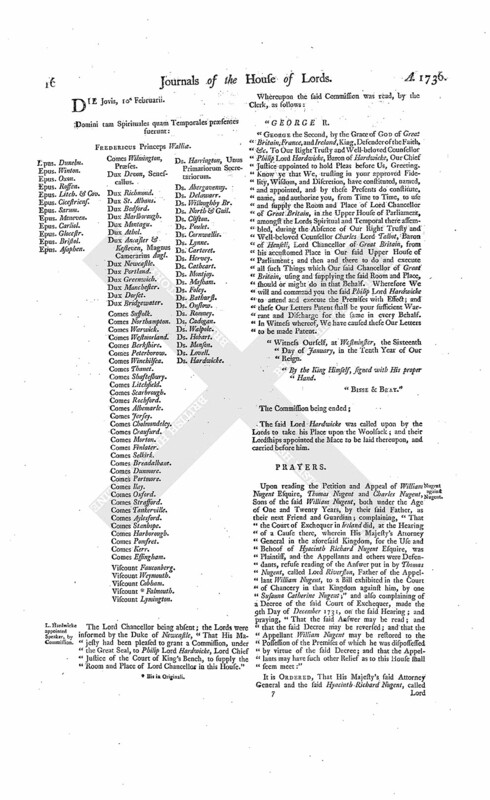 "Ordered, by the Lords Spiritual and Temporal in Parliament assembled, That the Lord Chancellor do transmit the Order of this House, for putting the Lord Dudley and Ward into Possession of all such Lands as the Earl and Countess of Meath obtained Possession of by or under Colour of the Order of the House of Lords in Ireland, of the 12th of February 1703, to the Lord Chancellor of Ireland; commanding him, at the same Time, to return as soon as he can an Account of what shall be done therein. 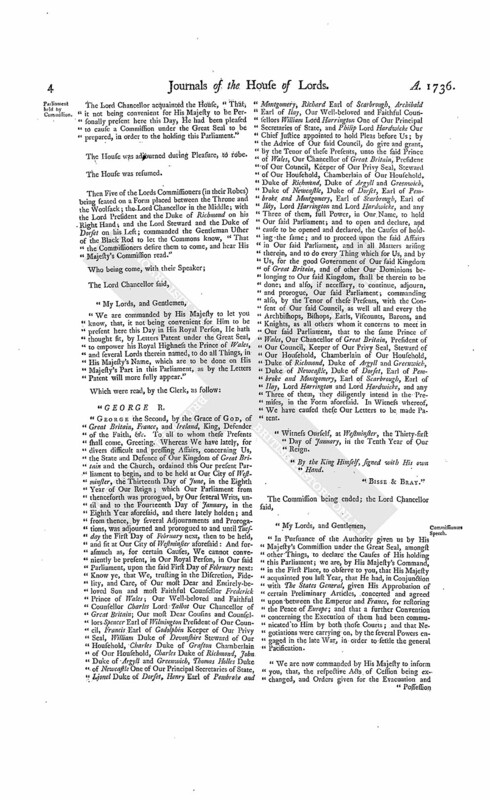 "By Order of the House of Lords (a Copy whereof I herewith send you), I transmit to your Lordship the Order of the said House; whereby the Court of Chancery in Ireland is commanded to put William Lord Dudley and Ward into Possession of all such Lands as the Earl and Countess of Meath obtained Possession of, by or under Colour of the Order of the House of Lords in Ireland, of the 12th of February 1703. Your Lordship will let me know, as soon as can be, what is done in Pursuance of their Lordships Order; as you see, by the abovementioned Copy, I am ordered to require of you. "And the said Jeffry French having made an Affidavit, on the Twenty-eighth Day of May last, of the Delivery of the said Packet to his Lordship; and that the same was neither opened nor altered, from the Time he the said Jeffry French received the same from Mr. Perkins, Secretary to the Right Honourable the Lord Talbot Lord Chancellor of Great Britain, to the Time the same was so delivered: Which Affidavit being produced to his Lordship on the Twentyninth of May aforesaid, his Lordship consulted with all the Lords the Judges upon the Matter; and they and his Lordship being unanimously of Opinion, that the said Orders of the House of Lords of Great Britain, and Letter, were sufficiently proved to have been transmitted to his Lordship by the Lord Chancellor of Great Britain; his Lordship this Day, in Court, delivered the said Orders of the Lords and Letter to the Register of this Court; and at the same Time directed the said Register to read the same, as also the said Affidavit; which the Register having accordingly done, his Lordship thereupon declared, "That he would make the said First-recited Order of the House of Lords of Great Britain an Order of this Court, unless any Person concerned for the Lord Dudley and Ward, in the said Order mentioned, should desire the same to be deferred; or that any other Person should shew any legal Objection to the contrary." "Whereupon Robert Marshall Esquire, Barrister at Law, informed the Court, "That, notwithstanding he was interested in some Part of the Lands which the said Lord Dudley and Ward laid Claim to, he would pay strict Obedience to the Order of the House of Lords of Great Britain;" and moved his Lordship, "That it might be taken Notice of by the Register, that, though he was a Member of the Parliament of this Kingdom, he now in Court waived any Privilege he might thereby have, so as to hinder the Execution of the said Order of the House of Lords;" it having been surmised to him, by the Lord Dudley and Ward's Agents and Managers, "That they dared not venture to proceed on the said Order, for fear of committing a Breach of Privilege." "And Mr. Francis Lodge, Agent and Manager for Edward Brabazon Esquire (in the said First-recited Order mentioned), appearing likewise in Court, and making the like Declaration for Mr. Brabazon that Mr. Marshall had made for himself, and declaring he did so by the Orders and Direction of the said Mr. Brabazon; his Lordship again asked, "Whether there was any Person in Court concerned for the Lord Dudley and Ward?" And no Person appearing for the said Lord Dudley and Ward: It is Ordered, by his Lordship, That the said First-mentioned Order of the House of Lords of Great Britain, bearing Date the Twenty-third Day of March One Thousand Seven Hundred and Thirty-five, be, and is hereby, received and made an Order of this Court. 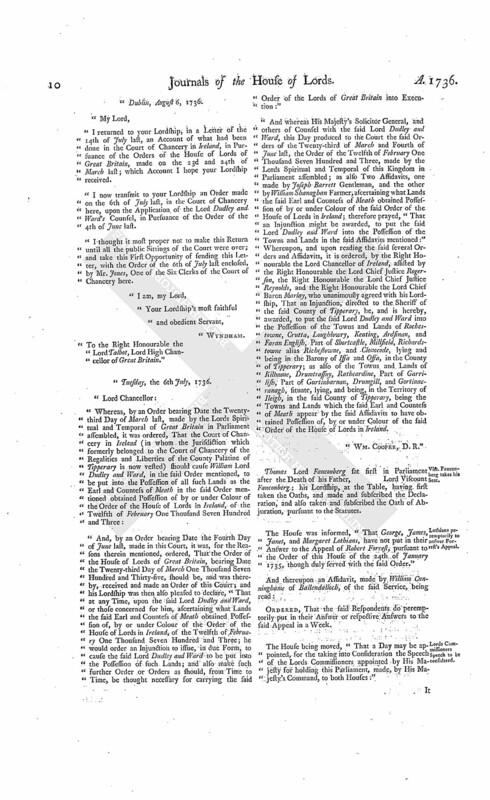 And his Lordship was also pleased to declare, That, at any Time, upon the said Lord Dudley and Ward, or those concerned for him, ascertaining what Lands the Earl and Countess of Meath (in the said Order mentioned) obtained Possession of, by or under Colour of the Order of the House of Lords in Ireland, of the Twelfth of February One Thousand Seven Hundred and Three, he would order an Injunction to issue, in due Form, to cause the said Lord Dudley and Ward to be put into the Possession of such Lands; and also make such further Order or Orders as should, from Time to Time, be thought necessary for carrying the said Order of the Lords of Great Britain into Execution. "I returned to your Lordship, in a Letter of the 14th of July last, an Account of what had been done in the Court of Chancery in Ireland, in Pursuance of the Orders of the House of Lords of Great Britain, made on the 23d and 24th of March last; which Account I hope your Lordship received. "I now transmit to your Lordship an Order made on the 6th of July last, in the Court of Chancery here, upon the Application of the Lord Dudley and Ward's Counsel, in Pursuance of the Order of the 4th of June last. "I thought it most proper not to make this Return until all the public Sittings of the Court were over; and take this First Opportunity of sending this Letter, with the Order of the 6th of July last enclosed, by Mr. Jones, One of the Six Clerks of the Court of Chancery here. "Tuesday, the 6th July, 1736. 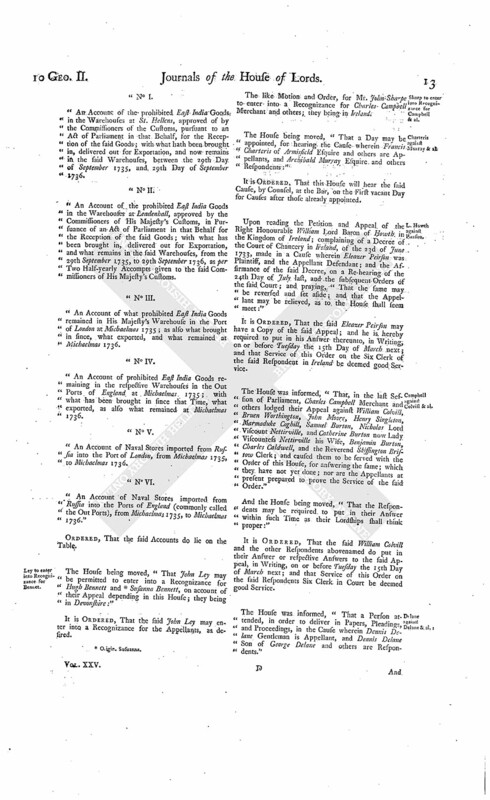 "And, by an Order bearing Date the Fourth Day of June last, made in this Court, it was, for the Reasons therein mentioned, ordered, That the Order of the House of Lords of Great Britain, bearing Date the Twenty-third Day of March One Thousand Seven Hundred and Thirty-five, should be, and was thereby, received and made an Order of this Court; and his Lordship was then also pleased to declare, "That at any Time, upon the said Lord Dudley and Ward, or those concerned for him, ascertaining what Lands the said Earl and Countess of Meath obtained Possession of, by or under Colour of the Order of the House of Lords in Ireland, of the Twelfth of February One Thousand Seven Hundred and Three; he would order an Injunction to issue, in due Form, to cause the said Lord Dudley and Ward to be put into the Possession of such Lands; and also make such further Order or Orders as should, from Time to Time, be thought necessary for carrying the said Order of the Lords of Great Britain into Execution:"
"And whereas His Majesty's Solicitor General, and others of Counsel with the said Lord Dudley and Ward, this Day produced to the Court the said Orders of the Twenty-third of March and Fourth of June last, the Order of the Twelfth of February One Thousand Seven Hundred and Three, made by the Lords Spiritual and Temporal of this Kingdom in Parliament assembled; as also Two Affidavits, one made by Joseph Barrett Gentleman, and the other by William Shanaghan Farmer, ascertaining what Lands the said Earl and Countess of Meath obtained Possession of by or under Colour of the said Order of the House of Lords in Ireland; therefore prayed, "That an Injunction might be awarded, to put the said Lord Dudley and Ward into the Possession of the Towns and Lands in the said Affidavits mentioned:" Whereupon, and upon reading the said several Orders and Affidavits, it is ordered, by the Right Honourable the Lord Chancellor of Ireland, assisted by the Right Honourable the Lord Chief Justice Rogerson, the Right Honourable the Lord Chief Justice Reynolds, and the Right Honourable the Lord Chief Baron Marlay, who unanimously agreed with his Lordship, That an Injunction, directed to the Sheriff of the said County of Tipperary, be, and is hereby, awarded, to put the said Lord Dudley and Ward into the Possession of the Towns and Lands of Rochestowne, Crutta, Loughlowry, Keating, Ardfinan, and Faran English, Part of Shortcastle, Millfield, Richardstowne alias Richestowne, and Clonocode, lying and being in the Barony of Iffa and Offa, in the County of Tipperary; as also of the Towns and Lands of Killmone, Drumtrassny, Rathcardine, Part of Garrilish, Part of Gurtinbarnan, Drumgill, and Gortinacranagh, situate, lying, and being, in the Territory of Ileigh, in the said County of Tipperary, being the Towns and Lands which the said Earl and Countess of Meath appear by the said Affidavits to have obtained Possession of, by or under Colour of the said Order of the House of Lords in Ireland. Visc. Fauconberg takes his Seat. Thomas Lord Fauconberg sat first in Parliament after the Death of his Father, Lord Viscount Fauconberg; his Lordship, at the Table, having first taken the Oaths, and made and subscribed the Declaration, and also taken and subscribed the Oath of Abjuration, pursuant to the Statutes. Lothians peremptorily to answer Forrest's Appeal. The House was informed, "That George, James, Janet, and Margaret Lothians, have not put in their Answer to the Appeal of Robert Forrest, pursuant to the Order of this House of the 24th of January 1735, though duly served with the said Order." Ordered, That the said Respondents do peremptorily put in their Answer or respective Answers to the said Appeal in a Week. Lords Commissioners Speech to be considered. The House being moved, "That a Day may be appointed, for the taking into Consideration the Speech of the Lords Commissioners appointed by His Majesty for holding this Parliament, made, by His Majesty's Command, to both Houses:"
It is Ordered, That the said Speech be taken into Consideration on this Day Sevennight; and the Lords to be summoned. Dominus Cancellarius declaravit præsens Parliamentum continuandum esse usque ad & in diem Lunæ, septimum diem instantis Februarii, hora undecima Auroræ, Dominis sic decernentibus. Dutchess of Bucks against Cox & Ux. & al. Lee to amend his Appeal. Upon reading the Petition of Thomas Lee Gentleman; praying, "That he may be at Liberty to amend his Appeal, by making the Executors of John Southwell Parties to the same, he amending the Respondent's Copy; no Answer having been as yet put in:"
It is Ordered, That the Petitioner be at Liberty to amend his Appeal, as desired; and that Agnes Southwell, George Rose, Henry Rose, John Vandeleur, Sarah Southwell, and Sir Maurice Crosby, do put in their Answer or respective Answers to the said Appeal, in Writing, on or before Monday the 14th Day of March next. Bennet to amend his Appeal. 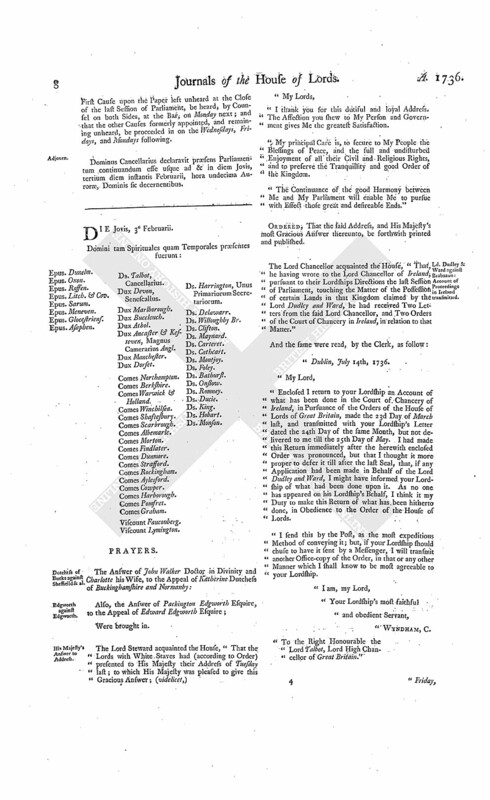 Upon reading the Petition of Hugh Bennet, an Infant, by Susanna Bennet, his Mother and next Friend; praying, "In regard Sarah Bailey, Respondent to the Petitioner's Appeal, is dead; that he may have Liberty to amend the same, by inserting the Name of John Bailey, of Northleigh, in the County of Devon, Gentleman, her Heir at Law:"
It is Ordered, That the Petitioner may amend his Appeal, as desired; and that the said John Bailey do put in his Answer thereunto, in Writing, on or before Monday the 21st Day of this Instant February. O'Farrel to amend his Appeal. Upon reading the Petition of Roger O'Ferrall Gentleman; praying, "In regard he is advised it is necessary to make Ambrose Farrell, who was a Party in the Cause in the Court of Chancery in Ireland, a Party to the Petitioner's Appeal, and likewise to amend the same in other Particulars; that he may be permitted to amend the same, by making the said Ambrose Farrell a Party, and in such other Points as he shall be advised:"
It is Ordered, That the Petitioner may amend his said Appeal, as desired; and that the said Ambrose Farrell do put in his Answer to the said Appeal, in Writing, on or before Monday the 14th Day of March next. D. Athol's Claim to the Barony of Strange. 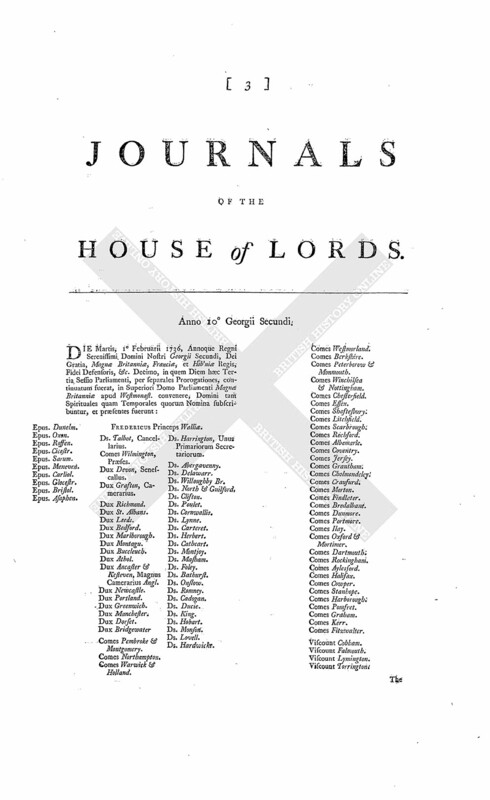 The Duke of Newcastle (by His Majesty's Command) presented to the House a Petition of James Duke of Athol, claiming the Barony of Strange; together with His Majesty's Reference thereof to this House, and the Report of the Attorney General to His Majesty thereupon. "That His Majesty King Henry the Seventh, in the First Year of His Reign, created Thomas Lord Stanley Earl of Derby, to him and the Heirs Male of his Body. "That the said Title and Dignity came by Mesne Descents to Ferdinando Earl of Derby; who died seised thereof, to him and the Heirs Males of the Body of the said Thomas; leaving Three Daughters, Anne, Frances, and Elizabeth, and no Son. "That the said Ferdinando did not die seised of any Title or Dignity of a Baron, created by Letters Patents; and whatever Titles and Dignities he had, which were created by any Writ or Writs of Summons to Parliament, descended to his said Three Daughters, and are now in Abeyance. "That the said Title and Dignity of Earl of Derby came to William Brother of the said Ferdinando, as Heir Male of the Body of the said Thomas; but the said William never was seised of the Title or Dignity of a Baron. "That James, Your Petitioner's Ancestor, whose Heir he is, Eldest Son of the said William, was summoned to Parliament in the Third Year of the Reign of King Charles the First as a Baron, the Writ being directed "Jacobo Strange, Chevalier;" and being also summoned to several ensuing Parliaments, in the said King's Reign, sat and voted by the said Title of Lord Strange, in the Life-time of his Father the said William Earl of Derby. "That, upon the Death of the said William Earl of Derby, the said James Lord Strange succeeded to the said Title and Dignity of Earl of Derby, and died seised thereof to him and the Heirs Males of the Body of the said Thomas Earl of Derby, and of the said Title and Dignity of Lord Strange, to him and his Heirs. "That the said Title and Dignity of Lord Strange came by Mesne Descents to the late Earl of Derby, who died without Issue in the Month of February, 1735. "That Your Petitioner is Cousin and next Heir to the said late Earl of Derby, and Great Grandson and sole Heir of the said James Lord Strange, and consequently entitled to the said Title and Dignity of Lord Strange. "Your Petitioner, therefore, humbly prays Your Majesty, That the said Title and Dignity of Lord Strange may be declared (as of Right it does) to belong to Your Petitioner and his Heirs. 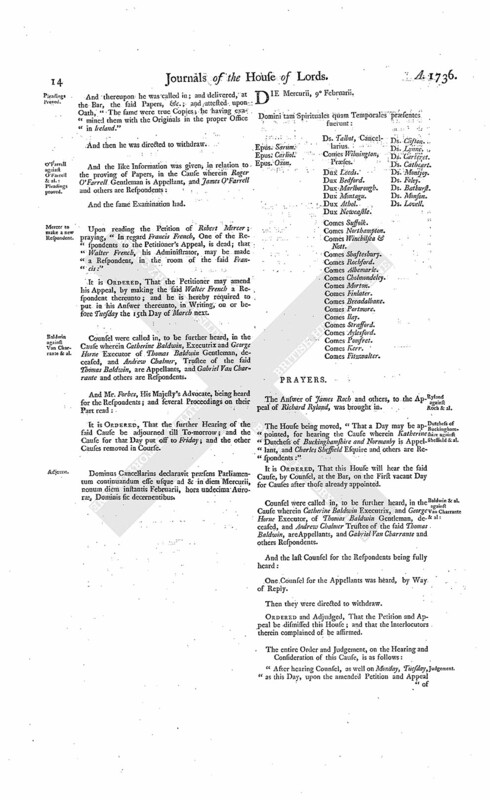 "And Your Petitioner shall ever pray, &c.
"His Majesty, being moved upon this Petition, is graciously pleased to refer the same, together with the Report thereunto annexed, to the Right Honourable the House of Peers, to examine the Allegations thereof, as to what relates to the Petitioner's Title therein mentioned; and to inform His Majesty how the same shall appear to their Lordships. 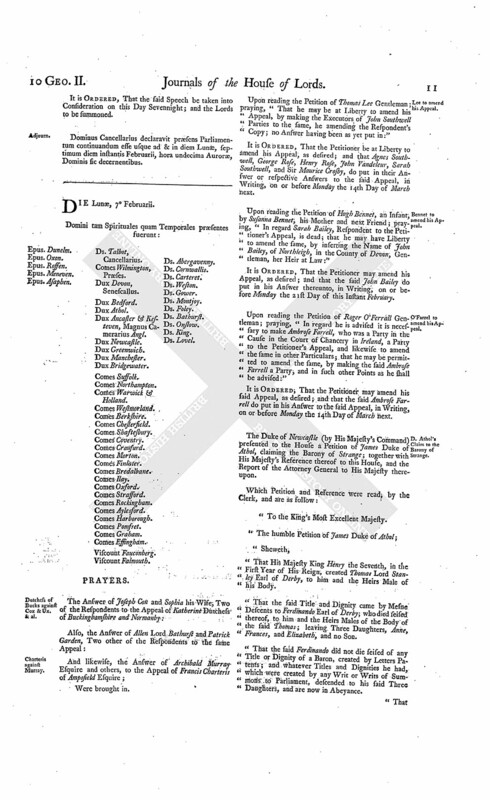 Ordered, That the said Petition be referred to the Consideration of the Lords Committees for Privileges; whose Lordships are to meet on this Day Fortnight; and, having considered thereof, and also the said Report thereunto annexed, and heard such Persons concerning the same as they shall think fit, are to report their Opinion thereupon to the House; and that Notice be given to His Majesty's Attorney General, on Behalf of the Crown. Baldwin & al. against Van Charrante & al. Counsel were called in, to be heard in the Cause wherein Catherine Baldwin, Executrix and George Horne Executor of Thomas Baldwin Gentleman, deceased, and Andrew Chalmer, Trustee of the said Thomas Baldwin, are Appellants, and Gabriel Van Charrante and others are Respondents. Dominus Cancellarius declaravit præsens Parliamentum continuandum esse usque ad & in diem Martis, octavum diem instantis Februarii, hora undecima Auroræ, Dominis sic decernentibus. Account of prohibited East India Goods, and Naval Stores. The House was informed, "That some of the Commissioners of the Customs attended:"
"An Account of prohibited East India Goods imported and exported, from Michaelmas 1735 to Michaelmas 1736; and an Account of Naval Stores imported from Russia, for the same Time." "An Account of the prohibited East India Goods in the Warehouses at St. Hellens, approved of by the Commissioners of the Customs, pursuant to an Act of Parliament in that Behalf, for the Reception of the said Goods; with what hath been brought in, delivered out for Exportation, and now remains in the said Warehouses, between the 29th Day of September 1735, and 29th Day of September 1736. "An Account of the prohibited East India Goods in the Warehouses at Leadenhall, approved by the Commissioners of His Majesty's Customs, in Pursuance of an Act of Parliament in that Behalf for the Reception of the said Goods; with what has been brought in, delivered out for Exportation, and what remains in the said Warehouses, from the 29th September 1735, to 29th September 1736, as per Two Half-yearly Accompts given to the said Commissioners of His Majesty's Customs. "An Account of what prohibited East India Goods remained in His Majesty's Warehouse in the Port of London at Michaelmas 1735; as also what brought in since, what exported, and what remained at Michaelmas 1736. "An Account of prohibited East India Goods remaining in the respective Warehouses in the Out Ports of England at Michaelmas 1735; with what has been brought in since that Time, what exported, as also what remained at Michaelmas 1736. "An Account of Naval Stores imported from Russia into the Port of London, from Michaelmas 1735, to Michaelmas 1736. "An Account of Naval Stores imported from Russia into the Ports of England (commonly called the Out Ports), from Michaelmas 1735, to Michaelmas 1736." Ley to enter into Recognizance for Bennet. The House being moved, "That John Ley may be permitted to enter into a Recognizance for Hugh Bennett and (fn. 1) Susanna Bennett, on account of their Appeal depending in this House; they being in Devonshire:"
It is Ordered, That the said John Ley may enter into a Recognizance for the Appellants, as desired. Sharp to enter into Recognizance for Campbell & al. The like Motion and Order, for Mr. John Sharpe to enter into a Recognizance for Charles Campbell Merchant and others; they being in Ireland. Charteris against Murray & al. The House being moved, "That a Day may be appointed, for hearing the Cause wherein Francis Charteris of Armisfield Esquire and others are Appellants, and Archibald Murray Esquire and others Respondents:"
Upon reading the Petition and Appeal of the Right Honourable William Lord Baron of Howth in the Kingdom of Ireland; complaining of a Decree of the Court of Chancery in Ireland, of the 23d of June 1733, made in a Cause wherein Eleazer Peirson was Plaintiff, and the Appellant Defendant; and the Affirmance of the said Decree, on a Re-hearing of the 24th Day of July last, and the subsequent Orders of the said Court; and praying, "That the same may be reversed and set aside; and that the Appellant may be relieved, as to the House shall seem meet:"
It is Ordered, That the said Eleazer Peirson may have a Copy of the said Appeal; and he is hereby required to put in his Answer thereunto, in Writing, on or before Tuesday the 15th Day of March next; and that Service of this Order on the Six Clerk of the said Respondent in Ireland be deemed good Service. Campbell against Colvill & al. 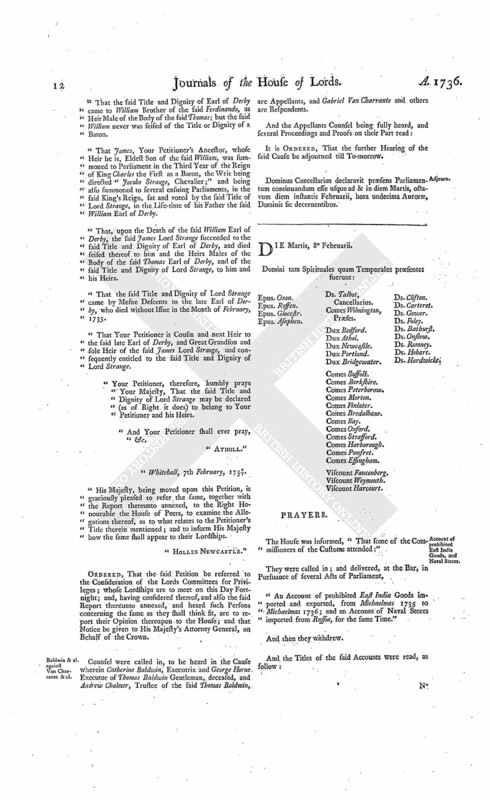 The House was informed, "That, in the last Session of Parliament, Charles Campbell Merchant and others lodged their Appeal against William Colvill, Bruen Worthington, John Moore, Henry Singleton, Marmaduke Coghill, Samuel Burton, Nicholas Lord Viscount Nettirville, and Catherine Burton now Lady Viscountess Nettirville his Wife, Benjamin Burton, Charles Caldwell, and the Reverend Skiffington Bristow Clerk; and caused them to be served with the Order of this House, for answering the same; which they have not yet done; nor are the Appellants at present prepared to prove the Service of the said Order." And the House being moved, "That the Respondents may be required to put in their Answer within such Time as their Lordships shall think proper:"
It is Ordered, That the said William Colvill and the other Respondents abovenamed do put in their Answer or respective Answers to the said Appeal, in Writing, on or before Tuesday the 15th Day of March next; and that Service of this Order on the said Respondents Six Clerk in Court be deemed good Service. The House was informed, "That a Person attended, in order to deliver in Papers, Pleadings, and Proceedings, in the Cause wherein Dennis Delane Gentleman is Appellant, and Dennis Delane Son of George Delane and others are Respondents." And thereupon he was called in; and delivered, at the Bar, the said Papers, &c.; and attested upon Oath, "That same were true Copies; he having examined them with the Originals in the proper Office in Ireland." O'Farrell against O'Farrell & al. : Pleadings proved. And the same Examination had. Mercer to make a new Respondent. Upon reading the Petition of Robert Mercer; praying, "In regard Francis French, One of the Respondents to the Petitioner's Appeal, is dead; that Walter French, his Administrator, may be made a Respondent, in the room of the said Francis:"
It is Ordered, That the Petitioner may amend his Appeal, by making the said Walter French a Respondent thereunto; and he is hereby required to put in his Answer thereunto, in Writing, on or before Tuesday the 15th Day of March next. Baldwin against Van Charrante & al. Counsel were called in, to be further heard, in the Cause wherein Catherine Baldwin, Executrix and George Horne Executor of Thomas Baldwin Gentleman, deceased, and Andrew Chalmer, Trustee of the said Thomas Baldwin, are Appellants, and Gabriel Van Charrante and others are Respondents. It is Ordered, That the further Hearing of the said Cause be adjourned till To-morrow; and the Cause for that Day put off to Friday; and the other Causes removed in Course. Dominus Cancellarius declaravit præsens Parliamentum continuandum esse usque ad & in diem Mercurii, nonum diem instantis Februarii, hora undecima Auroræ, Dominis sic decernentibus. Epus. Oxon. Ds. Talbot, Cancellarius. Ryland against Roch & al. The Answer of James Roch and others, to the Appeal of Richard Ryland, was brought in. Dutchess of Buckinghamshire against Sheffield & al. The House being moved, "That a Day may be appointed, for hearing the Cause wherein Katherine Dutchess of Buckinghamshire and Normanby is Appeallant, and Charles Sheffield Esquire and others are Respondents:"
Counsel were called in, to be further heard, in the Cause wherein Catherine Baldwin Executrix, and George Horne Executor, of Thomas Baldwin Gentleman, deceased, and Andrew Chalmer Trustee of the said Thomas Baldwin, are Appellants, and Gabriel Van Charrante and others Respondents. One Counsel for the Appellants was heard, by Way of Reply. Then they were directed to withdraw. Ordered and Adjudged, That the Petition and Appeal be dismissed this House; and that the Interlocutors therein complained of be affirmed. 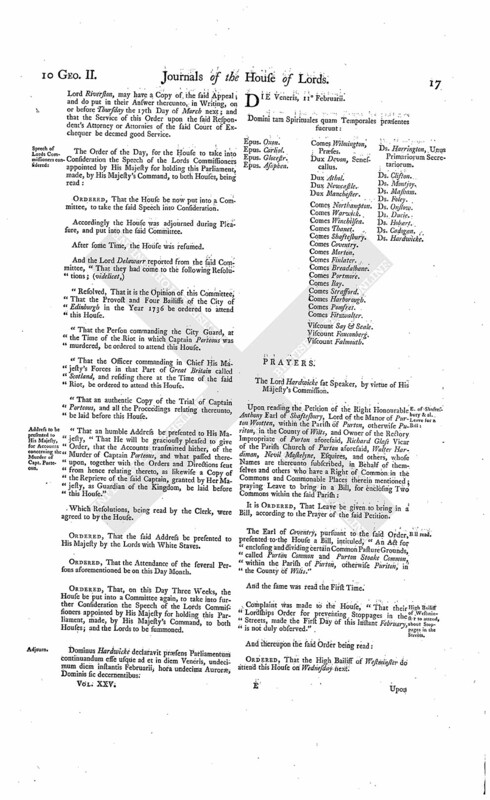 "After hearing Counsel, as well on Monday, Tuesday, as this Day, upon the amended Petition and Appeal of Catherine Baldwin Executrix, and George Horne Executor, of Thomas Baldwin, of the Parish of St. Margarets, Westminster, in the County of Middlesex, Gentleman, deceased, and Andrew Chalmer Writer in Edinburgh, Trustee of the said Thomas Baldwin; complaining of an Interlocutory Sentence of the Judge of the High Court of Admiralty in Scotland, of the 21st of December 1731, and of the several Interlocutory Sentences of the Lords of Session in Scotland, of the 12th and 31st Days of July and 14th Day of December 1733, the 15th and 26th Days of January 1733/4, the 13th of December 1734, the 25th of June and 22d of July 1735, made on the Behalf of Gabriel Van Charrante, Henry Brumer Steirsman, and Valli and Alexander Arbuthnot and Company, their Factors, and other Parties competing with the Appellants in the Cause; and praying, that the said Interlocutory Sentences may be reversed; and that the Interlocutors of the said Lords of Session, of the 21st of November 1733, and 11th of December 1734, may be affirmed, and such other Relief given as to the House shall seem meet: As also upon the joint and several Answers of the said Gabriel Van Charrante, Henry Brumer Steirsman, and Valli and Alexander Arbuthnot and Company, their Factors, put in to the said Appeal; and due Consideration had of what was offered on either Side in this Cause: It is Ordered and Adjudged, by the Lords Spiritual and Temporal in Parliament assembled, That the said Petition and Appeal be, and is hereby, dismissed this House; and that the said Interlocutors therein complained of be, and the same are hereby, affirmed." Upon reading the Petition and Appeal of Thomas Earl of Dundonald; complaining of an Interlocutor of the Lords of Session in Scotland, of the 24th of November 1736, made on the Behalf of Elizabeth Bar, Daughter and Heir of Patrick Bar; and praying, "That the same may be reversed; and such further Relief granted to the Appellant as to their Lordships shall seem meet:"
It is Ordered, That the said Elizabeth Bar may have a Copy of the said Appeal; and she is hereby required to put in her Answer thereunto, in Writing, on or before Wednesday the 9th Day of March next. Wauchope & al. against Wauchope & al. Upon reading the Petition and Appeal of Gilbert Wauchope Doctor of Medicine, Agnes Wauchope his Sister, and John Baillie Writer to the Signet, Factor constituted by the said Doctor Gilbert Wauchope; complaining of certain Interlocutors of the Lords of Session in Scotland, of the 29th of January 1735/6, the 27th of July and 10th of December 1736, made on the Behalf of Andrew Wauchope, and Mr. James Wauchope alias Don of Edminsone; and praying, "That the same may be reversed, altered, or varied, as to their Lordships great Wisdom and Justice shall seem meet:"
It is Ordered, That the said Andrew Wauchope and James Wauchope may have a Copy of the said Appeal; and they are hereby required to put in their Answer, or respective Answers thereunto, in Writing, on or before Wednesday the 9th Day of March next; and that Service of this Order upon the Respondents Agent, or Procurator, in the Court below, be deemed good Service. A Petition of John Piddock, Agent for Mary Craik, and Alexander Ross, Agent for Jean Craik and her Husband, Respondents to the Appeal of the said Mary Craik, was presented, and read; praying, "In regard the Parties have put the Matters in Dispute to Reference, that the Hearing of the Cause may be put off to such Time as to the House shall seem meet." Ordered, That the said Hearing be put off, as desired; with Liberty for either Side to apply for a Day of Hearing, in case the Parties do not agree. The House being moved, "That a Day may be appointed, for hearing the Cause wherein Dennis Delane Gentleman is Appellant, and Dennis Delane, Son of George Delane, and others, are Respondents:"
Gould to enter into a Recognizance for L. Howth. The House being moved, "That Nathaniel Gould Esquire may be permitted to enter into a Recognizance for William Lord Baron of Howth, on account of his Appeal depending in this House; he residing in Ireland:"
It is Ordered, That the said Nathaniel Gould Esquire may enter into a Recognizance for the Appellant, as desired. Pitt's Pet. referred to Judges. It is Ordered, That the Consideration of the said Petition be, and is hereby, referred to the Lord Chief Justice of the Court of Common Pleas and Mr. Justice Denton; who are forthwith to summon all Parties concerned in the Bill; and, after hearing them, to report to the House the State of the Case, with their Opinion thereupon, under their Hands; and whether all Parties that may be concerned in the Consequences of the Bill have signed the Petition; and also that the Judges having perused the Bill, do sign the same. Biggs & al. Pet. referred to Judges. Dominus Cancellarius declaravit præsens Parliamentum continuandum esse usque ad et in diem Jovis, decimum diem instantis Februarii, hora undecima Auroræ, Dominis sic decernentibus. L. Hardwicke appointed Speaker, by Commission. The Lord Chancellor being absent; the Lords were informed by the Duke of Newcastle, "That His Majesty had been pleased to grant a Commission, under the Great Seal, to Philip Lord Hardwicke, Lord Chief Justice of the Court of King's Bench, to supply the Room and Place of Lord Chancellor in this House." "George the Second, by the Grace of God of Great Britain, France, and Ireland, King, Defender of the Faith, &c. To Our Right Trusty and Well-beloved Counsellor Philip Lord Hardwicke, Baron of Hardwicke, Our Chief Justice appointed to hold Pleas before Us, Greeting. Know ye that We, trusting in your approved Fidelity, Wisdom, and Discretion, have constituted, named, and appointed, and by these Presents do constitute, name, and authorize you, from Time to Time, to use and supply the Room and Place of Lord Chancellor of Great Britain, in the Upper House of Parliament, amongst the Lords Spiritual and Temporal there assembled, during the Absence of Our Right Trusty and Well-beloved Counsellor Charles Lord Talbot, Baron of Hensell, Lord Chancellor of Great Britain, from his accustomed Place in Our said Upper House of Parliament; and then and there to do and execute all such Things which Our said Chancellor of Great Britain, using and supplying the said Room and Place, should or might do in that Behalf. Wherefore We will and command you the said Philip Lord Hardwicke to attend and execute the Premises with Effect; and these Our Letters Patent shall be your sufficient Warrant and Discharge for the same in every Behalf. In Witness whereof, We have caused these Our Letters to be made Patent. "Witness Ourself, at Westminster, the Sixteenth Day of January, in the Tenth Year of Our Reign. The said Lord Hardwicke was called upon by the Lords to take his Place upon the Woolsack; and their Lordships appointed the Mace to be laid thereupon, and carried before him. 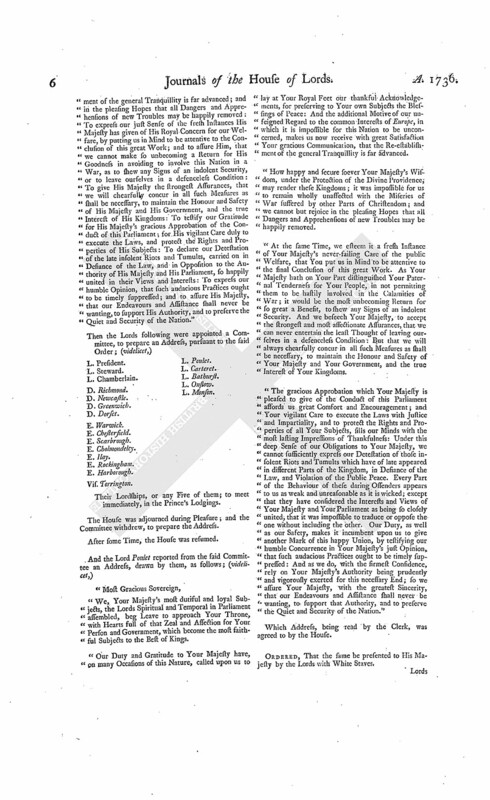 Upon reading the Petition and Appeal of William Nugent Esquire, Thomas Nugent and Charles Nugent, Sons of the said William Nugent, both under the Age of One and Twenty Years, by their said Father, as their next Friend and Guardian; complaining, "That the Court of Exchequer in Ireland did, at the Hearing of a Cause there, wherein His Majesty's Attorney General in the aforesaid Kingdom, for the Use and Behoof of Hyacinth Richard Nugent Esquire, was Plaintiff, and the Appellants and others were Defendants, refuse reading of the Answer put in by Thomas Nugent, called Lord Riverston, Father of the Appellant William Nugent, to a Bill exhibited in the Court of Chancery in that Kingdom against him, by one Susanna Catherine Nugent;" and also complaining of a Decree of the said Court of Exchequer, made the 9th Day of December 1731, on the said Hearing; and praying, "That the said Answer may be read; and that the said Decree may be reversed; and that the Appellant William Nugent may be restored to the Possession of the Premises of which he was dispossessed by virtue of the said Decree; and that the Appellants may have such other Relief as to this House shall seem meet:"
It is Ordered, That His Majesty's said Attorney General and the said Hyacinth Richard Nugent, called Lord Riverston, may have a Copy of the said Appeal; and do put in their Answer thereunto, in Writing, on or before Thursday the 17th Day of March next; and that the Service of this Order upon the said Respondent's Attorney or Attornies of the said Court of Exchequer be deemed good Service. Ordered, That the House be now put into a Committee, to take the said Speech into Consideration. Accordingly the House was adjourned during Pleasure, and put into the said Committee. "Resolved, That it is the Opinion of this Committee, That the Provost and Four Bailiffs of the City of Edinburgh in the Year 1736 be ordered to attend this House. "That the Person commanding the City Guard, at the Time of the Riot in which Captain Porteous was murdered, be ordered to attend this House. "That the Officer commanding in Chief His Majesty's Forces in that Part of Great Britain called Scotland, and residing there at the Time of the said Riot, be ordered to attend this House. "That an authentic Copy of the Trial of Captain Porteous, and all the Proceedings relating thereunto, be laid before this House. Address to be presented to His Majesty, for Accounts concerning the Murder of Capt. Porteous. "That an humble Address be presented to His Majesty, "That He will be graciously pleased to give Order, that the Accounts transmitted hither, of the Murder of Captain Porteous, and what passed thereupon, together with the Orders and Directions sent from hence relating thereto, as likewise a Copy of the Reprieve of the said Captain, granted by Her Majesty, as Guardian of the Kingdom, be laid before this House." Which Resolutions, being read by the Clerk, were agreed to by the House. Ordered, That the Attendance of the several Persons aforementioned be on this Day Month. Ordered, That, on this Day Three Weeks, the House be put into a Committee again, to take into further Consideration the Speech of the Lords Commissioners appointed by His Majesty for holding this Parliament, made, by His Majesty's Command, to both Houses; and the Lords to be summoned. Dominus Hardwicke declaravit præsens Parliamentum continuandum esse usque ad et in diem Veneris, undecimum diem instantis Februarii, hora undecima Auroræ, Dominis sic decernentibus.